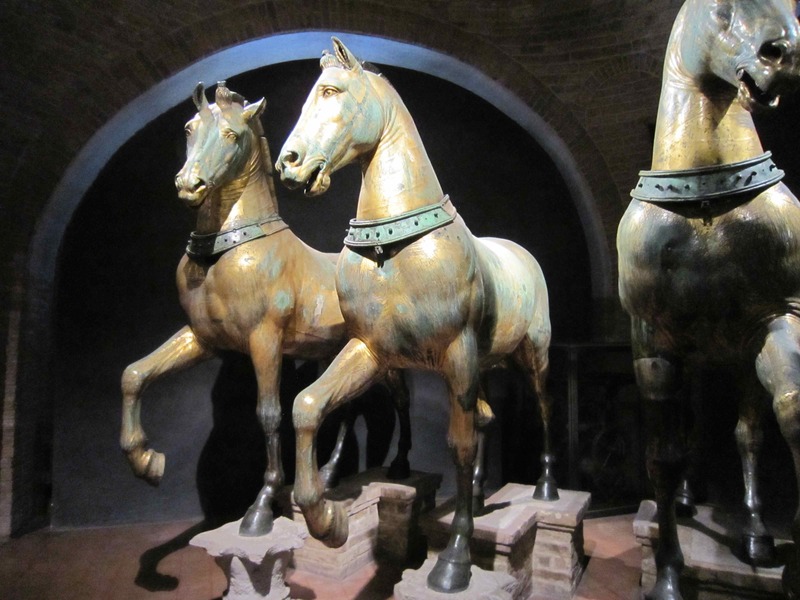 The copper horses of St Mark’s Basilica, Venice. Photo: Rosemary Forrest. Emerging from somewhere unconfirmed in classical Greece or Rome, this quadriga of horses lived in Constantinople until it was sacked by the Venetians in 1204, and they were carried off to stand guard over the Basilica of St Mark’s. Like many horses, they experienced literal upheavals in times of war, and were stolen by Napoleon in 1797 for a Parisian triumphal arch, and only returned in 1815. To Venice, that is, not Constantinople. In anticipation of damage in World War One they were taken by barge all the way to the Palazzo Venezia in Rome for safekeeping, and in the Second World War they were also packed up before being restored to pride of place. Air pollution achieved what global war could not, however, and in the 1980s they were moved into the interior of the church, and replaced with replicas. Venice, by Jan Morris. 1993 Faber edition. Thank you to Mum for the photo. This entry was posted in Equestrian Art, Italy and tagged St Mark's Basilica, Venice. Bookmark the permalink.